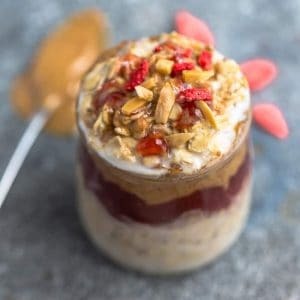 Peanut Butter & Jelly Overnight Oats | Easy & Yummy Breakfast Idea! Peanut Butter and Jelly Overnight Oats are a healthy, gluten free twist on a classic childhood flavor combination. Made with PB & J, and hearty oats, it’s such a delicious breakfast! By now, you guys know how much we love quick and easy breakfasts – breakfast egg muffins, baked oatmeal cups or overnight oats. 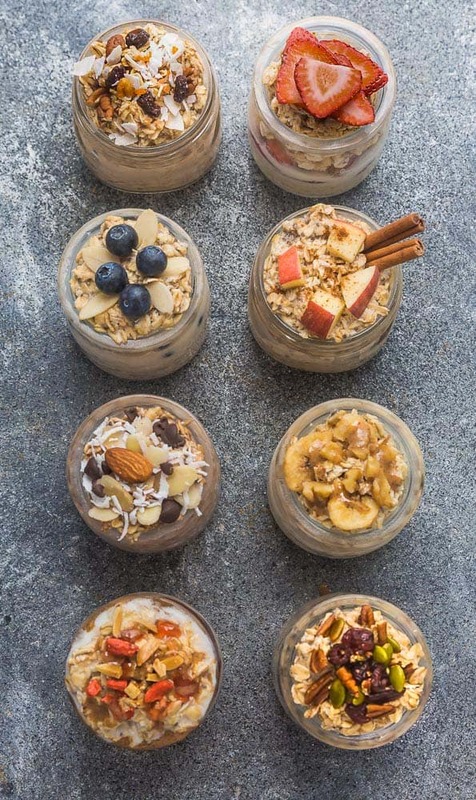 These 8 overnight oats have been so popular lately, so I’m slowly trying to give each of those recipes their own post along with the nutritional breakdown. Have you guys heard of overnight oats? Overnight oats are just uncooked old fashioned oats that you soak with liquid overnight. They require less than 5 minutes of prep time and are super easy to customize and I love that you can make a batch on meal prep Sunday with your favorite flavors. These Peanut Butter and Jelly Overnight Oats are a twist on the classic childhood favorite PB & J sandwiches. My kids absolutely love the anything with PB & J and this no cook recipe is perfect on those mornings when you don’t feel like turning on the oven when it’s too hot outside. 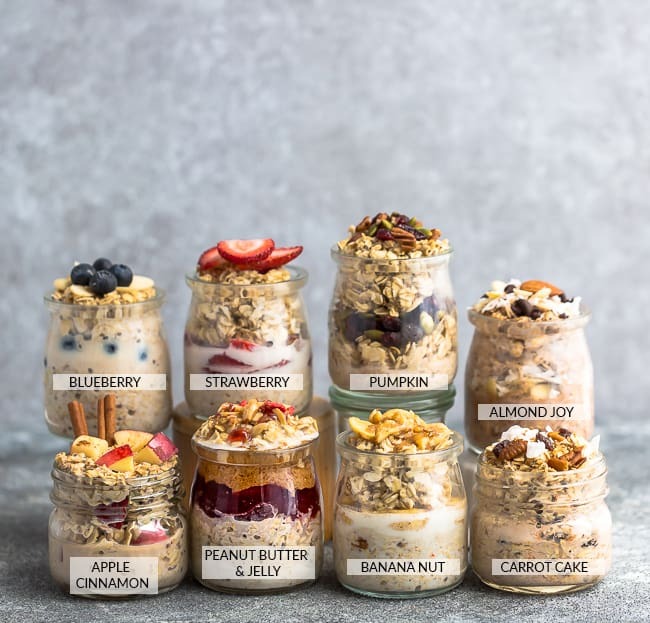 WHAT DO I NEED TO MAKE OVERNIGHT OATS? 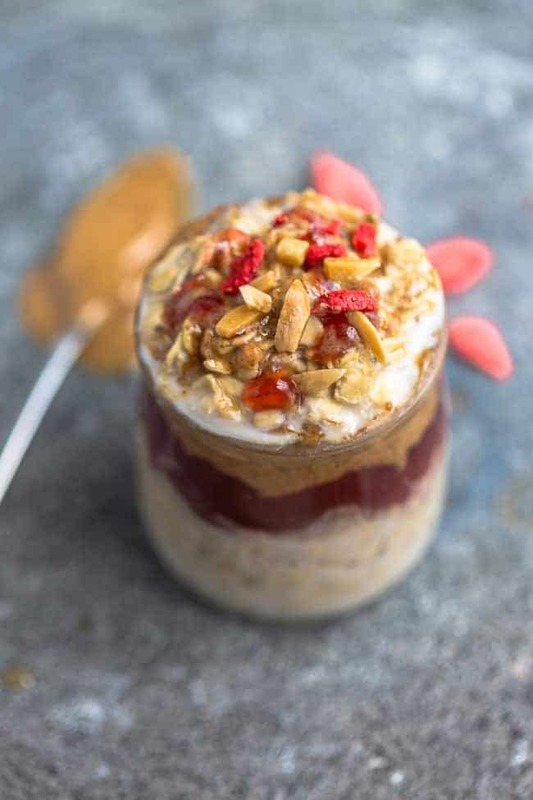 These PB&J overnight oats are one of the easiest breakfasts that even your kids can help you assemble the night before. You can use a mason jar, resealable container or a bowl. Start by combining rolled or old fashioned oats with your favorite milk and / or coconut or Greek yogurt in a 8 oz. mason jar, resealable container or a bowl. These 7 oz jars are the ones you actually see in the photos and are currently my favorite ones. Add peanut butter, jam, vanilla and sweetener if using. Alternatively, you can layer the peanut butter and jam separately in the middle like the photos. Strawberry, banana, blueberries or for more Overnight Oatmeal options – be sure to check this post out with 8 fun flavors! 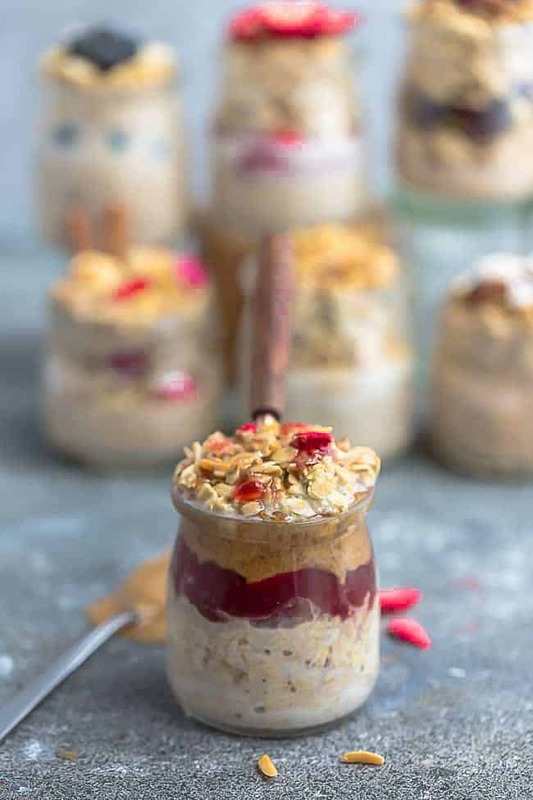 Peanut Butter and Jelly Overnight Oats are a healthy gluten free twist on the classic childhood favorite breakfast on the go. Made with PB & J, and hearty oats. Add sweetener (if using), peanut butter, jam and vanilla to the mason jar. (Alternatively, you can also layer the peanut butter and jam separately like I did in the photos). Serve with more milk as desired and top with another layer of peanut butter, jam, freeze-dried berries and chopped peanuts before serving, if desired. We make this all the time! Thank you! Loved this, thank you! It was delicious! These were so delicious!Thank you!